RESULT! Our councillors – at last – stand up, refuse to do any favours and demand EXEMPLARY LEADERSHIP and the very highest standards of CONDUCT and INTEGRITY from their senior staff rather than the “anything goes for us” culture they’ve assiduously developed for themselves over many years. 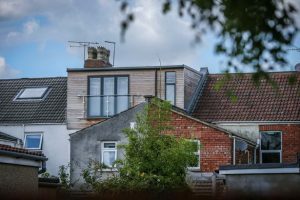 A planning committee last night REFUSED their Property Assets boss, Rich “The Builder” Fear planning permission for his appalling and intrusive loft extension that breaks local planning regulations in Knowle. Rich the Builder thought a PAINT JOB and a bit of FAKE ROOF added to his unlawful carbuncle – that a planning inspector has already ruled should be pulled down – would be enough to persuade a planning committee to let him keep the large-shed-plonked-on-a-roof-style extension he’s subjected his long-suffering Knowle neighbours to. Hear! Hear! Send in the wrecking ball and invite Fear the pisstaker to resign. This entry was posted in News and tagged Bristol City Council, Dormer, Haverstock Road, Knowle, Property Services, Richard Fear, Service Manager (Property) Assets on July 13, 2017 by thebristolblogger. In these times of council austerity it is time that Richard Fear stopped burning off money with appeals regarding his loft extension. Furthermore the problem is not purely aesthetic as the structure breaches two structural party walls and therefore constitutes a fire hazard. Also if Richard Fear is employed as a property Investment manager his incompetence in managing his own property investment calls for his resignation.